HUAYRAPATA, Peru, Dec 6 2018 (IPS) - Thirty families from a rural community more than 4,300 meters above sea level will have warm houses that will protect them from the freezing temperatures that each year cause deaths and diseases among children and older adults in this region of the southeastern Peruvian Andes. José Tito, 46, and Celia Chumarca, one year younger, peasant farmers who live in the village of Quinsalakaya and are part of the group of 30 families whose new houses will be finished this month and who will be able to spend the end of the year without cold or smoke in their homes. “We have two daughters, ages seven and four, and they are the ones who suffer the most from the freezing temperatures. We want to be warm in our homes, and that’s why we decided to participate in this project, which is new here, it hasn’t been seen before,” Tito told IPS, enthusiastic about the prospect of having a house where the cold doesn’t seep in through cracks in the walls. The Andes highlands region of Puno is one of the coldest in Peru. Between May and September the temperature drops at night to 18 degrees Celsius below zero, causing acute respiratory illnesses and deaths, especially among children and the elderly. But because of climate change, temperature can plunge below freezing even in December (the start of the southern hemisphere summer) in the Andes highlands inhabited largely by Quechua indigenous people. Pedro Gómez, 70, who lives in Quinsalakaya with his son, told IPS that the night before the temperature plunged below freezing unexpectedly. “It’s very cold and it’s always like this around here, you get the flu, a sore throat, especially with the smoke from the cooking fire. 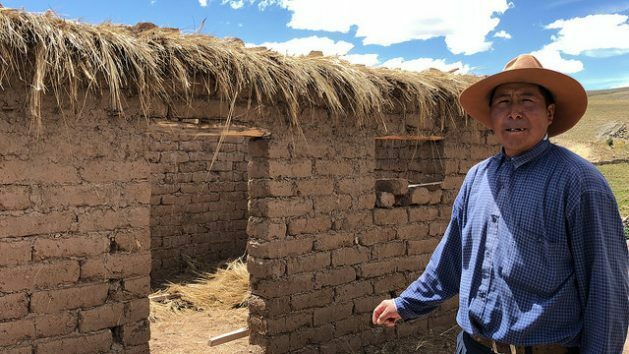 That’s why I decided to do this and get a better house,” he explained in the doorway of his new home still under construction, in this small village more than 1,300 kilometers southeast of Lima. “Warm houses” is the name of the project that the Methodist Church of Peru is involved in to help the families of this community “next to the sky” as the locals describe it, because it seems as if their rooftops touched the bright blue sky. 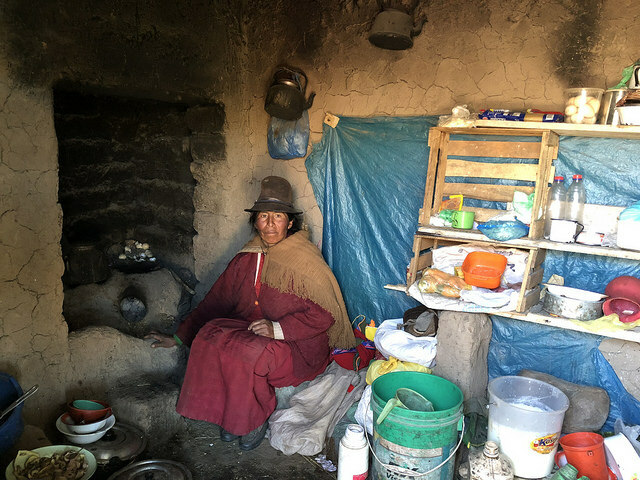 Quinsalakaya is home to some 50 families with an average of four members, all of whom are Quechua speakers. They depend on subsistence agriculture and livestock for a living. The village belongs to the district of Huayrapata, one of the four in the Puno province of Moho. From the central part of the municipality of about 5,000 inhabitants, it is reached in three hours walking or one hour if the rugged journey is made by motorcycle. It has a school, but lacks a medical post. When respiratory complications occur or any other health problem that cannot be treated with home remedies, the people of Quinsalakaya have to go to the nearest town that has a public health facility. 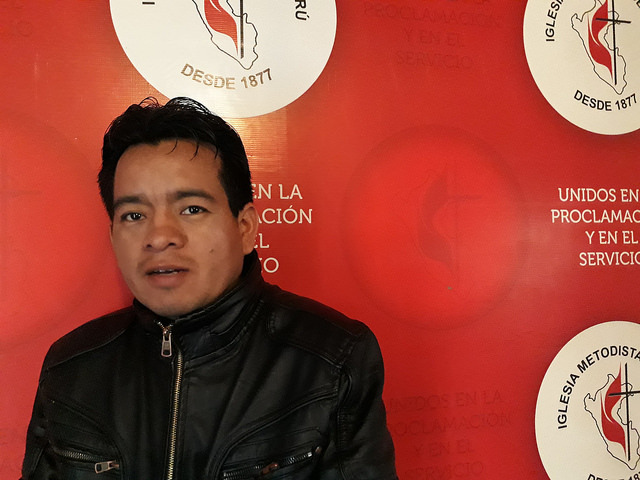 “Given this situation, we want to help the families have a sustainable shelter that prevents illnesses, improves their health conditions and their quality of life,” Mario Aliaga, pastor of the Methodist Church and coordinator of the warm houses project, told IPS in Lima. The houses are built with a Trombe wall to capture solar energy and keep the warmth in, and they include the installation of fireplaces with chimneys. The Trombe wall faces in the direction of the sun and is built with materials that accumulate heat – adobe bricks in this case – between which an air and ventilation space is created, thus forming what is called a solar thermal collector. It is an easily installable and usable technique that works by establishing a difference in density of hot and cold air, which creates currents by the orientation of the open ventilation points, thus channeling the accumulated hot air inside. For the Peruvian Methodists, the initiative has brought about a change in the way they respond to climate emergencies. They have gone from donating clothes and blankets to promoting an alternative means of heating that also contributes to the exercise of citizenship of the women and men of the first beneficiary community. Aliaga says they are helping to break down a welfare mentality because being part of the project entails obligations and responsibilities, which in fact kept some of the local families from joining in. “In return, the families provide some local inputs and, after training and technical assistance, communal work for the construction of the house and its maintenance,” he explained. An average of 740 dollars is invested in each house in materials for the roof, columns, doors, windows and the heating system and fireplace with a chimney. The heating system is expected to function optimally for five to six years, after which the valves inside the wall and the ventilation hatches must be replaced, which the families will do as a community. “The Trombe wall does not need solar panels, it’s a system that is installed in a corner of the house and that takes advantage of sunlight to collect the solar energy that at night is channeled into the house,” said Aliaga. The project is funded by the international organisation ACTAlliance which brings together 150 churches and organisations of different faiths, one of whose objectives is to achieve climate and environmental justice. If the results, as expected, are positive, the plan is to replicate the initiative in other villages in the area. The project includes the installation of stoves with chimneys to replace the existing ones that, lacking chimneys, pollute the homes with smoke, causing chronic respiratory diseases, especially in women and children, and claiming the lives of children, according to the World Health Organisation. Betsi Chalco, 21, is the mother of two children, a three-year-old and a one-month-old, and hopes that they will not suffer from the cold or the illnesses it causes. “When my little house is finished in a few days, we’ll be warm and the stove will be different because it fills the house up with smoke now. And everything will be cleaner,” she said, with enthusiasm. Néstor Flores, 48, is also optimistic. “I’m thinking about the future, I’m making our house with adobe to keep it warm and the roof with reeds and plaster. It will be beautiful. It will have its kitchen, its bedroom and in freezing weather my children, my wife and I will be warm,” he told IPS with a smile. “That’s why I’m happy, because these projects have never made it here, we don’t feel the presence of the government either,” he added. Although the Peruvian government has had a multisectoral plan to combat the effects of cold weather since 2012, which is updated annually, its coverage is insufficient. In seven years, they have reached 1,172 districts, an average of only 167 per year, which has so far left out Andes highlands communities such as Quinsalakaya. Peru has 1,655 municipalities, in a country considered the third most vulnerable to climate change in the world, according to local official data, which exposes it to the increase in frequency and intensity of natural events such as frost and freezing temperatures.